Although The Nightmare Before Christmas reflected the gothic imagination of Tim Burton, much of the charm was down to the directorial skills of Henry Selick, whose latest film Coraline places him alongside Nick Park as a rare master of the discipline of stop-motion animation. With barely a hint of computer generated trickery, Coraline is a lush and visually imaginative adaptation of Neil Gaiman’s children’s novel, depicted though the eyes of Coraline Jones, voiced by Dakota Fanning. After her family move to Pink Mansions, Coraline quickly becomes bored with the large dusty house, and in particular with her parents (Teri Hatcher, John Hodgman), who seem devoted not to her adolescent needs, but to the computers they’re writing a gardening catalogue on. 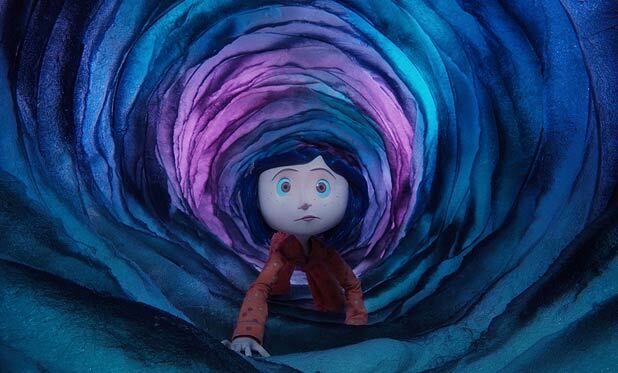 Selick’s film depicts Coraline’s humdrum existence over a lengthy, low-key build-up, but the fantasy kicks into top gear when she discovers a secret door that leads her into an alternate version of her home. As well as finding that her parents are transformed into her Other Mother and Other Father, attentive creatures with buttons for eyes, Coraline also encounters a variety of other eccentrics including competitive neighbours Miss Forcible and Miss Spink (Dawn French and Jennifer Saunders), Mr Bobinsky the strongman (Ian McShane) and a surly cat (Keith David) which can flit effortlessly between dimensions. Although there’s no song-and-dance numbers, or even visual jokes to lighten the pervasive gloom, Selick’s film presents a macabre and often scary menagerie of eye-boggling creatures that’s effective in both the 3D and 2D presentations supplied, with the dark, disturbing imagery gaining narrative weight from the moral strength of the central conceit. Coraline may be nothing more than a little girl who wants attention, but her experiences in the inverted household teach her that although receiving soulless devotion might be fun for a while, real affection has to be earned. Selick’s film offers the kind of ‘be careful what you wish for’ message familiar from children’s literature, but dressed up in innovative stop-motion trimmings which render Gaiman’s tale freshly entertaining, for children or adults alike. General release from Fri 8 May.